My husband and children are huge fans of Sister Schubert’s Cinnamon Rolls which are absolutely delicious and it is our favorite Christmas morning breakfast tradition. 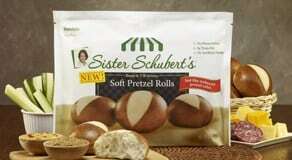 We were thrilled to learn that Sister Schubert’s® Homemade Rolls are adding two restaurant favorites to the home kitchen. The new Soft Pretzel Rolls and Mini Baguettes are ready to serve in less than ten minutes and have an amazing artisan bread taste. I really appreciate that these rolls are made using the highest quality ingredients and do not include any preservatives, artificial flavors or trans fats. Not only are these rolls delicious but it is a product that I will feel good about serving to my family. The Soft Pretzel Rolls sound like a tasty appetizer or even a slider roll because it has a “thin, slightly crisp outside and a soft, warm center.” My family would definitely enjoy these as an evening snack. The Mini Baguettes have a “golden, crispy crust and a soft, airy center”…….sounds divine with just a touch of butter or dipped in olive oil and seasonings! If you are like me and love delicious, artisan quality bread then you are probably very excited to try Sister Schubert’s Homemade rolls for yourself. You are invited to visit SisterSchuberts.com to find a store location, learn more about the newest products and get delicious recipe ideas.